Good morning ... Nothing is more fun than March Madness. Nothing. We told you yesterday that conservatives like Freedom Caucus Chairman Mark Meadows and Sen. Ted Cruz really don't like the emerging Affordable Care Act market stabilization plan. 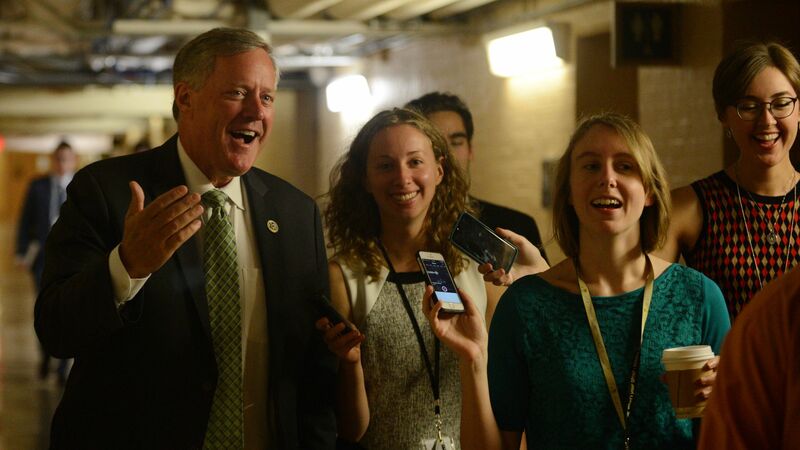 Axios' Caitlin Owens talked with Meadows a little more yesterday about his opposition, and he suggested that adding a provision bolstering the administration's efforts on short-term health plans could win him over. "Any additional effort to include CSR payments in the Omnibus must include real reforms to actually reduce premiums and not just subsidize premiums. The Barrasso language is one of the few options being discussed that would really impact rates. Consideration of CSR’s without that would be a nonstarter," he said. Sen. John Barrasso introduced a bill last week that legislatively defines short-term plans as lasting up to a year, and also makes them renewable — a step further than what the administration has proposed. The problem: The conventional wisdom is that hardline conservatives' votes aren't up for grabs on the omnibus spending bill, making it pointless to spend much time trying to win their support on the health care component. "They aren't voting for the omni anyway. So who cares what they think," a senior GOP Senate aide said. Lobbyists with the pharmacy benefit management industry met with federal officials last month, warning that Medicare Part D premiums will rise by 22% in 2019 if the government pursues an idea that would lower what Medicare patients pay for medications at the pharmacy counter. Why it matters: PBMs and other companies that sell Medicare drug plans dislike the proposal, which would require them to apply rebates and fees at the point of sale as a way to make drugs cheaper, and a final ruling is expected soon. Go deeper: My colleague Bob Herman — who just yesterday dug into PBMs' contract negotiations — has much more on axios.com. Aneesh Chopra, the former chief technology officer in the Obama administration, has a smart piece in Recode about the practical steps needed to let patients own and share their health care data. What it really shows, though, is what an uphill battle it’s going to be for the Trump administration initiative. A culture change, like encouraging patients to ask for electronic discharge instructions when they’re released from hospitals. Faster progress in standardizing health records so they can be used anywhere. Keeping an eye out for mischief from businesses that would make less money if patients can share their health data more easily. Reality check: The culture change and standardizing health records may be doable, but not anytime soon, because the health care industry is really slow about these things. And prevent self-interested mischief from businesses that lose money? Good luck with that. I have some bad news: It turns out Hollywood’s depictions of emergency rooms and surgeries is not super accurate. Shocking, right? Wired asked Annie Onishi, a general surgery resident at Columbia University, to watch some hospital scenes from prominent movies and TV shows and break down what they got right. The answer: Not much. Operating rooms don’t have viewing galleries any more, Onishi says, so the whole Junior Mint fiasco from “Seinfeld” is even more ridiculous than you thought. What we're watching today: Butler alum Bob Herman would like you to know that Butler tips off against Arkansas at 3:10pm. Let's trash-talk about basketball: baker@axios.com.